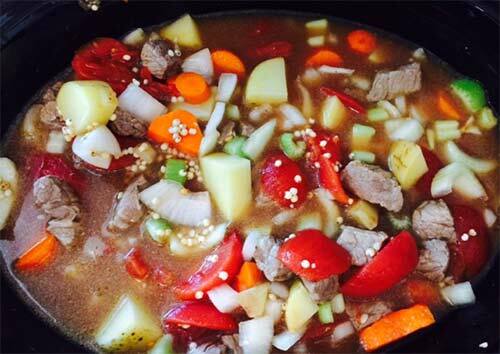 When I was a child my mother used to make this wonderful beef and barley stew. I can’t eat barley now, because it contains gluten, but I thought I would try this stew with whole grain sorghum instead. Fall is coming soon and this recipe makes a good, hearty meal that will stick with you through those chilly evening football games. 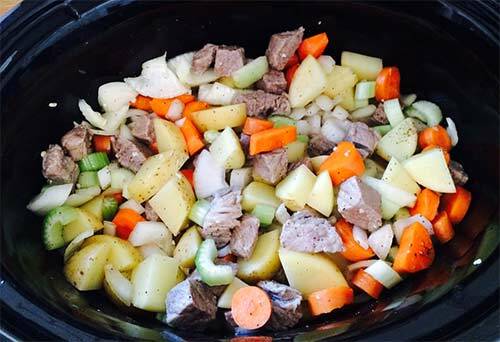 This stew will cook more quickly on the stove, if you don’t want to use a slow cooker. Feel free to change up the seasoning to suit your taste. I used some basil that I grew in my garden last year and dried. I also put in some fresh thyme I have growing in my garden this year and it was really good. I love using fresh herbs in soups whenever I can. Whole grain sorghum has a slightly courser texture than barley. It also will tend to fall apart when you cook it a long time. I liked that, because it thickened the stew a little bit. If you’re cooking this on the stove at a higher temperature, the sorghum takes about 1 to 1.5 hours to cook to a soft texture. I let the whole grain sorghum soak in a cup full of water while I prepared the rest of the ingredients. I soaked the sorghum in water while preparing other vegetables and then rinsed it before adding it to the stew. 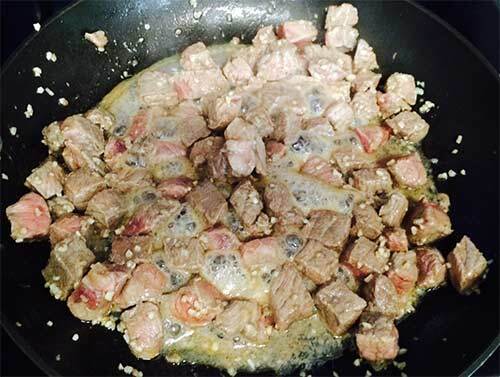 Cut beef into bite-sized chunks and sauté in the olive oil with the minced garlic and pepper for 5 minutes, or until browned. Place seasoned meat in your slow cooker. Beef and minced garlic browning in skillet with a little olive oil. Add chopped vegetables, beef broth, tomatoes, and basil. 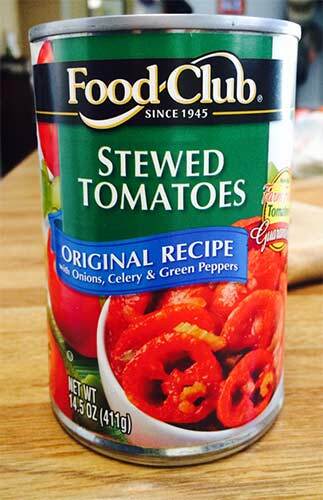 Here are the canned tomatoes I used in the stew. 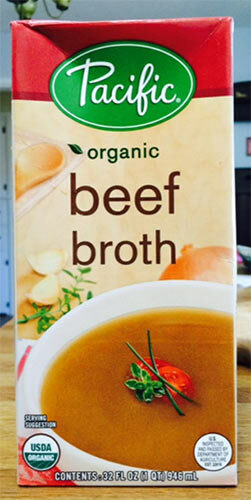 This is the brand of beef broth I like to use because it doesn’t taste as salty as some others. 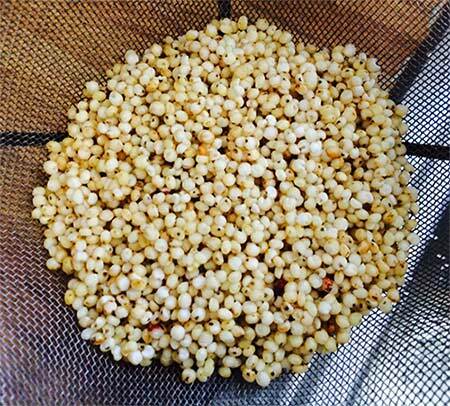 Drain sorghum in a strainer and rinse. Add sorghum to stew. Beef, vegetables, broth and whole grain sorghum added to the slow cooker. Cover and cook on low setting for 6 hours, then on high for 1 hour, or until the vegetables and sorghum are tender. 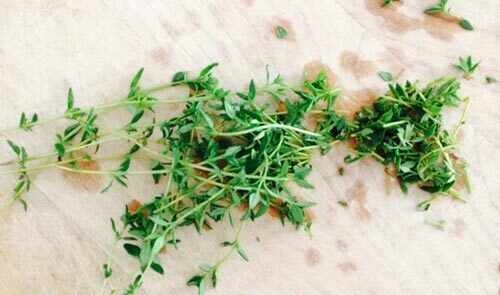 Add the thyme just before serving. I used chopped, fresh thyme from my garden. Serve warm with gluten-free breadsticks or cheese biscuits. Beef stew is the BEST SMELL in the whole world! I watched Maizy cooking it ALL DAY and FINALLY she put a little taste in my bowl. I LOVE having dinner with Maizy! I generally try to limit my consumption of processed foods in my quest to get proper nutrition while sticking to a gluten-free diet, but I do enjoy having a plain old bowl of cereal for breakfast every now and then. I admit that most gluten-free cereals aren’t very good, especially for the price, and many of them have a lot of added sugar to help them taste better. I like to add walnuts and fruit to my cereal to increase the nutritional content. Gluten-free cereals tend to be low on certain nutrients, especially B vitamins, unless they are enriched or fortified. 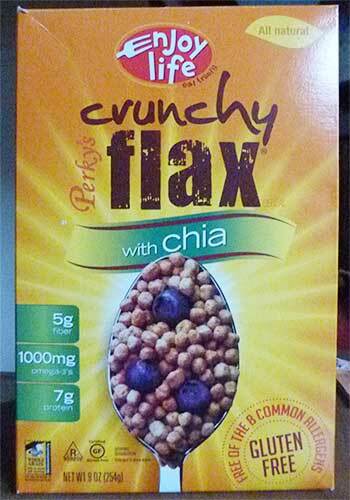 One of my favorite gluten-free cereals is Perky’s Crunchy Flax with Chia by Enjoy Life. What I like about this cereal is that it’s slightly sweet without being too sweet and it sticks with me throughout the morning. I believe it’s staying power comes from my favorite ingredient – whole grain sorghum flour! Sorghum is high in insoluble fiber, which, combined with protein and starch in the sorghum endosperm, makes it more slowly digested than other cereals. The slower rate of digestibility of sorghum products makes them more filling and may be beneficial to diabetics. Enjoy Life is one of the first companies in the U.S. that has used sorghum as a main ingredient. 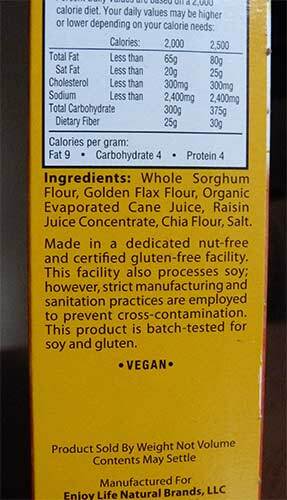 Sorghum flour is the first ingredient. 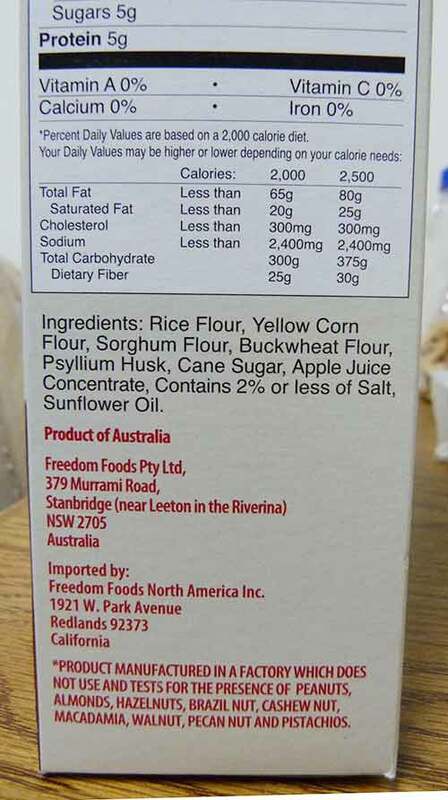 Another gluten-free cereal I tried recently is Ancient Grain Flakes by Freedom Foods, an Australian company. Although the flavor of the cereal was ok for a gluten-free cereal, I was disappointed by the misleading description of the cereal on the front of the box. It says the cereal is “made from buckwheat and sorghum”, but when you look at the ingredient list on the side of the box, it has rice and corn listed as the first two ingredients, then sorghum and buckwheat. Sorghum is the third ingredient. One thing I did like about the Freedom Foods cereals was the allergen symbols at the bottom. This makes it easier to see which common allergens have been eliminated from the product. 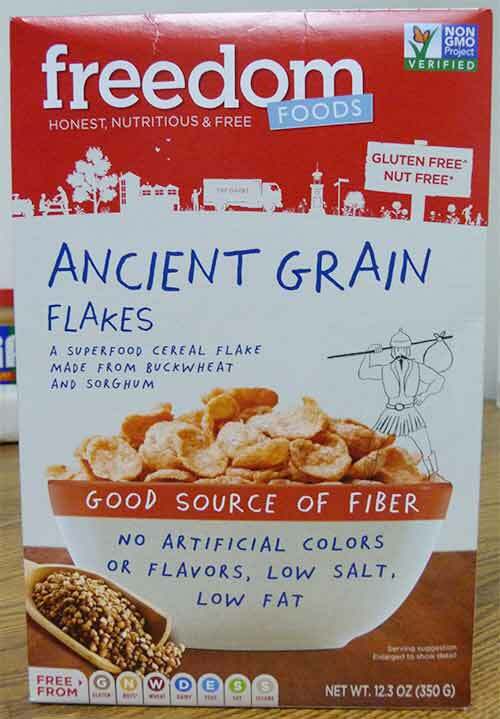 The allergen icons at the bottom of the Ancient Grain Flakes box are a nice idea. The flakes have a definite corn flavor when you first bite into them. I found that I was hungry again about two hours after I ate this cereal. I probably won’t be getting this one again. Happiness is LICKING the cereal bowl when Maizy is finished with it! Posted in Uncategorized, What is Sorghum? I made these breadsticks last weekend to go with an Italian chicken soup that I love to make in the summer when I have fresh eggplant, tomatoes and bell peppers from my garden. The original recipe called for 1 1/3 cups of rice flour, so I split that into equal amounts of rice and sorghum flour. This makes a breadstick that is slightly heavier in texture, but more flavorful and nutritious, in my opinion. I decided to sprinkle them with dried rosemary instead of parsley – I love the flavor of rosemary in bread! These breadsticks are best served warm right out of the oven, but I found the leftover breadstick was still pretty good warmed up in the toaster oven two days later. Combine yeast and other dry ingredients, in a mixing bowl. Add olive oil and vinegar to milk and stir together. 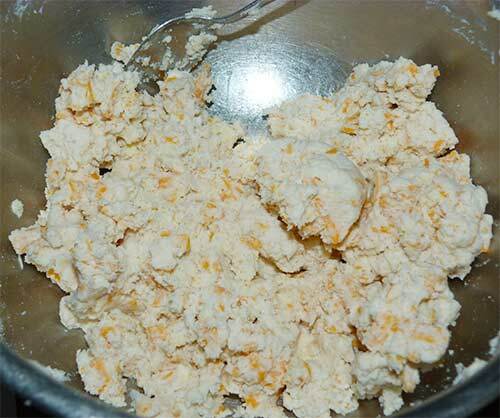 Slowly add milk mixture to dry ingredients and stir until a thick dough is formed. I mixed this by hand and it worked ok, but you can use a mixer if you prefer. The dough will be very sticky. 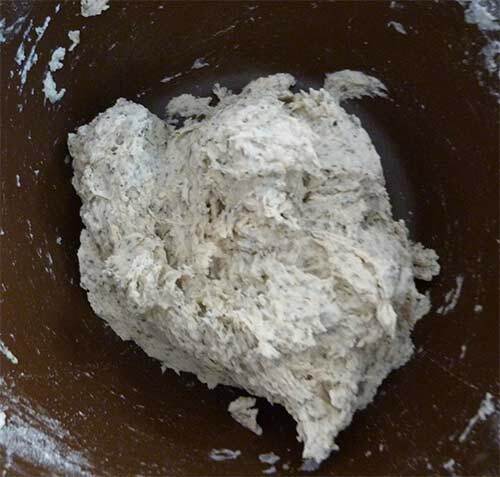 Wet ingredients added to make a thick dough. 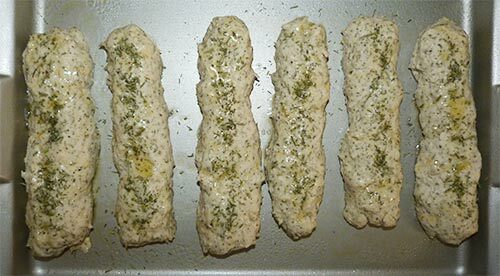 Coat hands with small amount of olive oil and divide the dough up into 6 equal portions. Putting oil on your hands will make the sticky dough manageable. You can also use plastic bags over your hands or latex gloves, if it is easier and less messy. 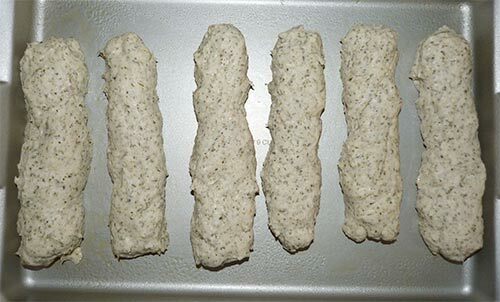 I put a small amount of olive oil on my hands before making each breadstick to handle and form the dough more easily. Form each portion into a long breadstick that is uniform from end to end, coating hands with small amount of olive oil between each one. They will bake more uniformly if they are of even size and proportion. 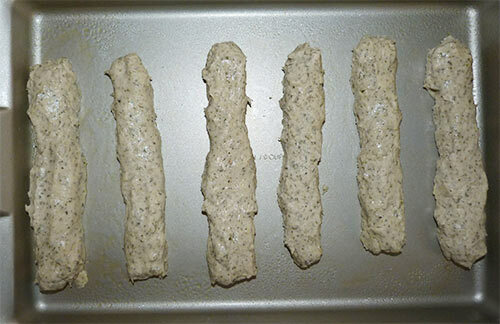 Place each formed breadstick on the greased baking sheet. I wasn’t ready to bake the breadsticks right away, so I let them sit covered with a towel for about 40 minutes and they puffed up a little. You can cook them right away, though, if you want to. The dough has puffed up a little after waiting about 40 minutes. Combine the melted butter and garlic powder in a small bowl. 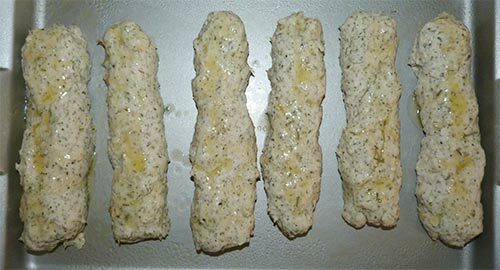 Brush butter mixture on top of each breadstick. I brushed melted butter on each breadstick. 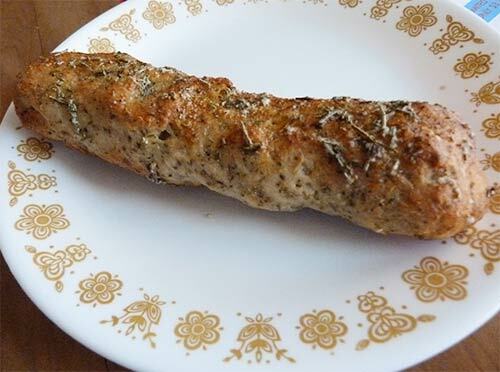 Sprinkle bread sticks with rosemary. I sprinkled crushed rosemary on top of the buttered dough. Bake for 15 minutes or until nicely browned. 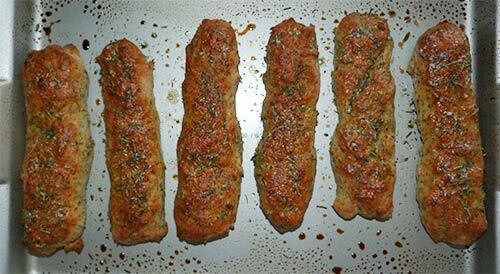 Brush breadsticks with remaining butter mixture. After I took them out of the oven, I brushed them with the rest of the melted garlic butter. Each breadstick was about 6 – 7 inches long. Adapted from Megan’s Italian Garlic Breadstick recipe at TheGlutenFreeVegan.com. When I take Maizy for a walk, she always puts a leash on me first. I think she’s afraid she’ll get LOST if she gets away from me. I can ALWAYS smell the way back home, especially when it smells like breadsticks! These cheese biscuits were so good I made them two days in a row. The original recipe that I found here called for one cup of rice flour and 1/2 cup of sorghum flour, but I switched it to 1 cup of sorghum flour and 1/2 cup of rice flour. I wanted to use more sorghum flour because it is more nutritious than rice flour – plus I Love Sorghum! Preheat oven to 400 degrees. Mix dry ingredients together in a large bowl. Cut in butter until crumbly. Add the buttermilk and cheese and mix thoroughly. If you do not have buttermilk you can substitute a cup of any kind of milk with a teaspoon of cider vinegar added. The dough will be very thick. The biscuit dough was very thick and could be easily rolled into balls. Spray baking sheet with olive oil spray or line with parchment paper. 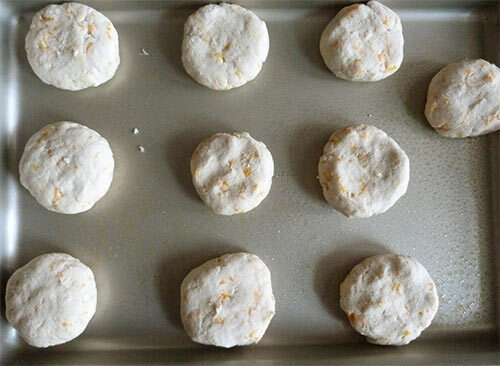 Roll biscuit dough into balls. 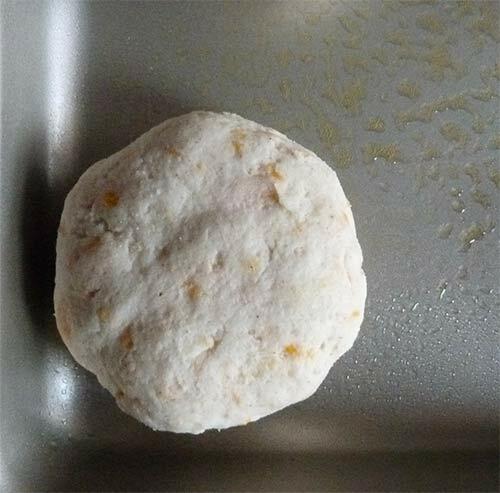 When you have a nice 1 to 2-inch ball formed, flatten it slightly and place on the baking sheet. If you place them with sides touching, they will rise up a little more. I kept them separated so they would be crispier all around the outside. One batch of dough made ten biscuits. Each biscuit was about 2 inches in diameter. Makes 8 to 12 biscuits. Bake in preheated oven 10-15 minutes (depending on size of biscuits) or until lightly browned. 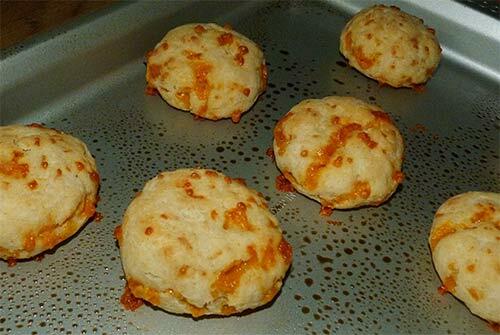 Gluten-free cheese biscuits fresh out of the oven. Adapted from Gloria’s Gluten-free Cheesy Biscuits at glutenfreepoodlehome.com. Only when one catches their TAIL can one understand the CIRCLE OF LIFE! 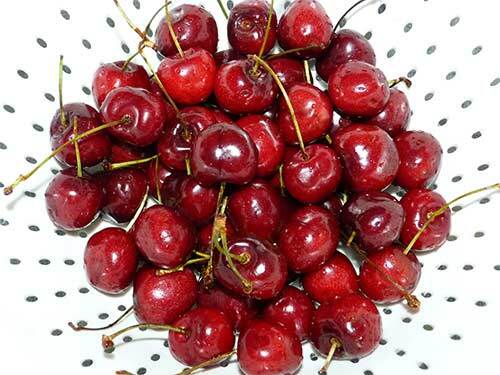 Bing cherries are in season and on sale at the grocery store – what a great opportunity to try a cherry dessert I’ve never made! 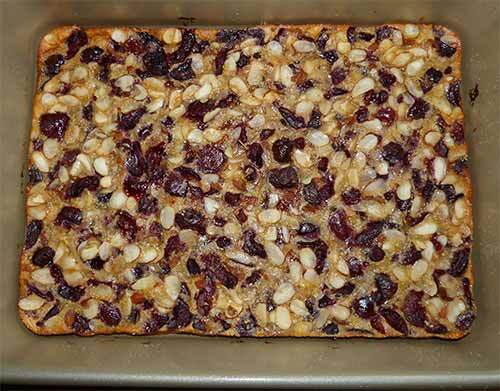 I had never heard of clafouti before I found it in Carol Fenster’s cookbook “Gluten-Free Quick & Easy”. She recommends using a blender to mix the batter, but I used a whisk and it worked just fine. I used a cake pan that was too big, so my clafouti turned out a little, well, little. 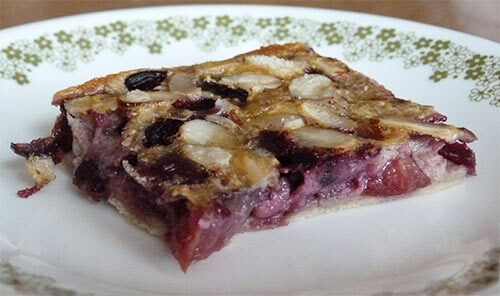 It was only about a half-inch thick, but it tasted great – not too sweet, very cherry! 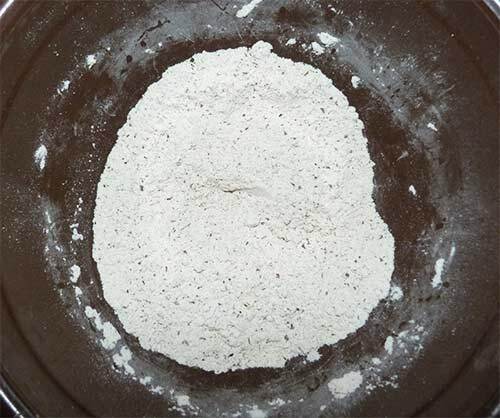 Preheat the oven to 350 degrees F. Grease a 9-inch square baking pan or round pie pan. I used a 9×12-inch pan and it was a bit too big. I used olive oil cooking spray in the bottom of the pan. 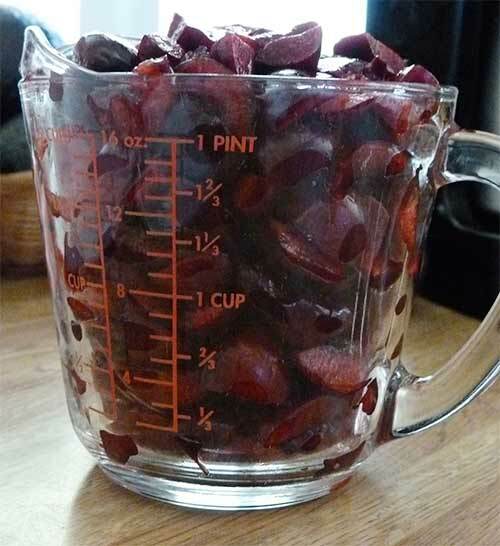 Two cups of pitted and sliced cherries – plus a little. Place the cherries in the prepared pan and sprinkle with one tablespoon of the sugar. Pour the batter over the cherries. Sprinkle with almonds and remaining sugar. Bake 40 to 45 minutes or until cake is spongy. Let cool in pan for five minutes before serving. Serve warm sprinkled with powdered sugar. My cherry clafouti wasn’t very thick because my pan was too big. Still good, though, even without the powdered sugar! Source: “Gluten-Free Quick & Easy” by Carol Fenster. For Carol’s blog, click Here. Maizy took me to the VET yesterday. He pinched me and it made me growl just a little bit. BUT he gave me a TREAT, so it wasn’t THAT bad. I would do it again for another doggie sausage. Yummy!